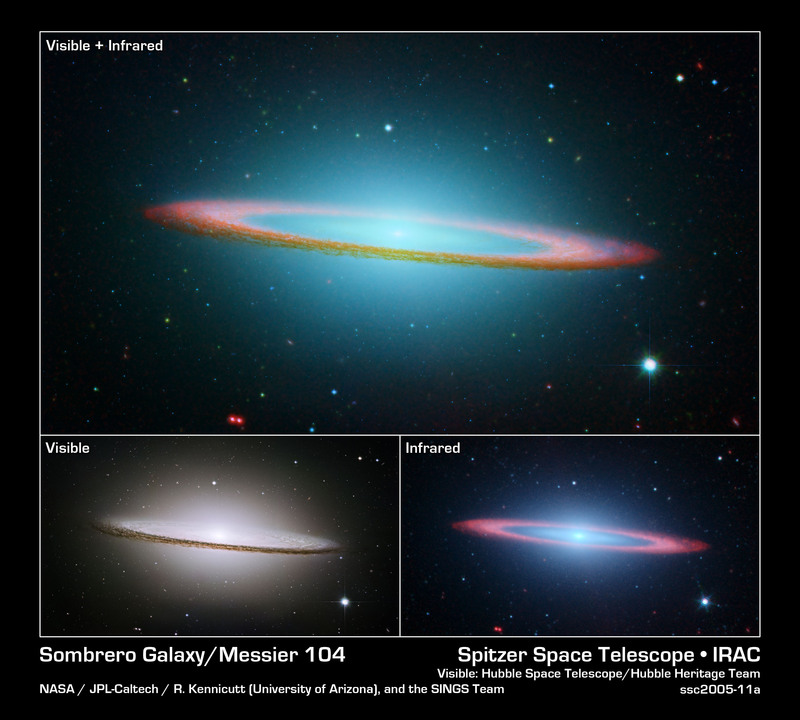 In figure 1, the new picture of Messier 104 combines a recent infrared observation from NASA's Spitzer Space Telescope with a well-known visible light image from the Hubble Space Telescope. In the Hubble Space Telescope's visible light image (lower left panel), only the near rim of dust can be clearly seen in silhouette. Recent observations using Spitzer's infrared array camera (lower right panel) uncovered the bright, smooth ring of dust circling the galaxy, seen in red. Spitzer's infrared view of the starlight, pierced through the obscuring dust, is easily seen, along with the bulge of stars and an otherwise hidden disk of stars within the dust ring. Spitzer's full view shows the disk is warped, which is often the result of a gravitational encounter with another galaxy, and clumpy areas spotted in the far edges of the ring indicate young star-forming regions. In figure 2, the infrared space telescope adds new detail to the galaxy's hallmark characteristics, such as the bright, bulbous core encircled by its thick dust lanes. 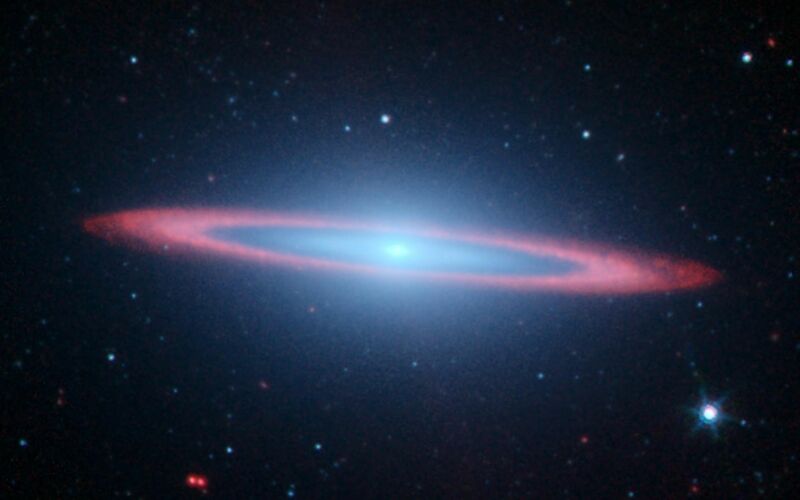 Since infrared light can trace the dust, the dark, murky ring glows brilliantly in infrared. 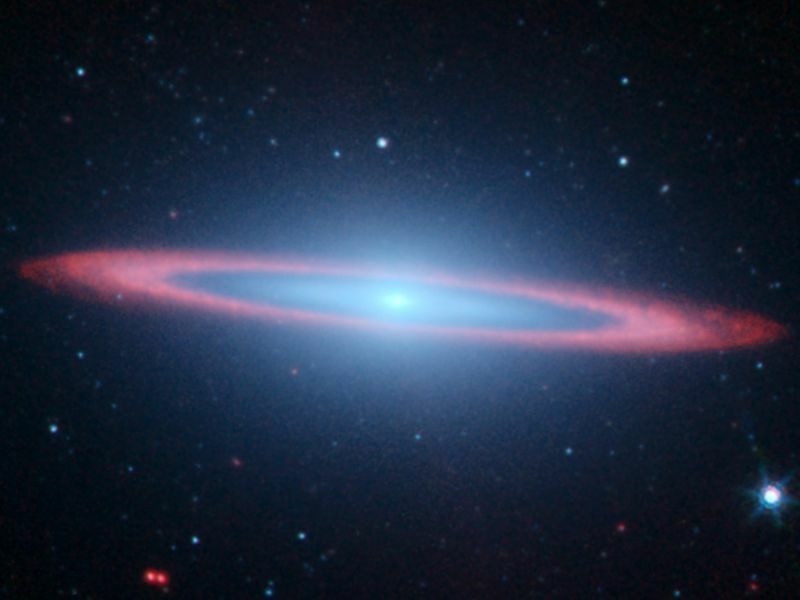 The clumpy dust ring also becomes transparent to starlight in infrared, allowing a clear view of the inner disk of stars within the dust ring. 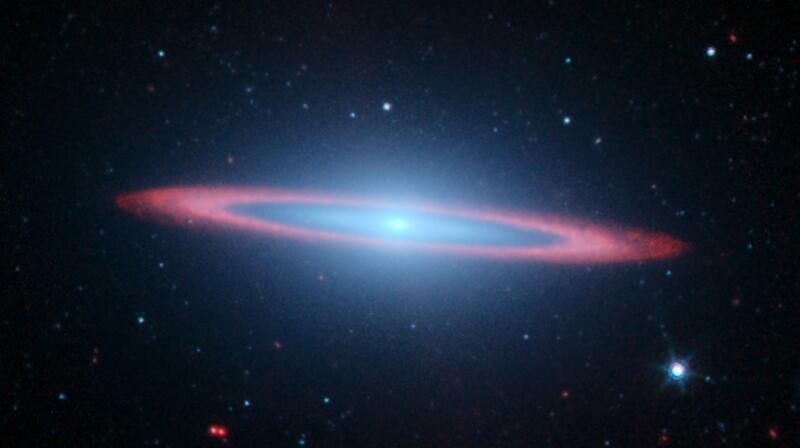 Viewed from Earth, the Sombrero galaxy is seen nearly edge-on, just six degrees away from its equatorial plane. This spiral galaxy is located 28 million light years away and is 50,000 light-years across. The Sombrero is one of the most massive objects at the southern edge of the Virgo cluster of galaxies, and is equal in size to 800 billion Suns. It hosts a rich system of nearly 2,000 globular clusters, 10 times as many as orbit our Milky Way galaxy. 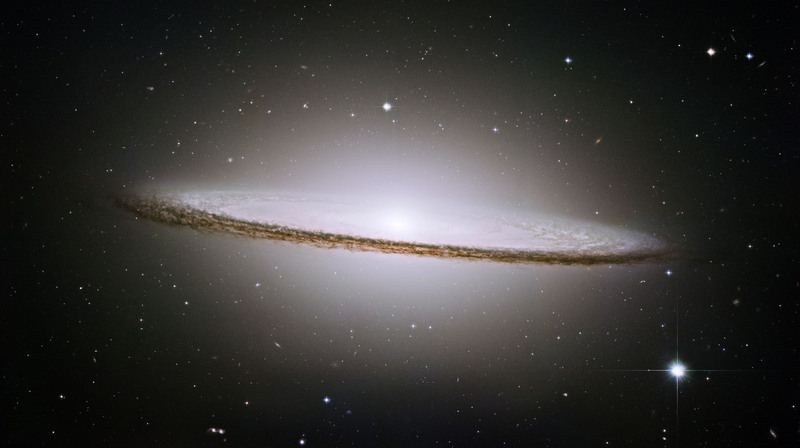 It is also interesting that the Sombrero galaxy may harbor a super-massive black hole, accounting for the electromagnetic glow emitted from its center. The Hubble images were taken by the Hubble Heritage Team in May-June 2003 with the space telescope's advanced camera for surveys. Spitzer's images were taken in June 2004 and January 2005 as part of the Spitzer Infrared Nearby Galaxies Survey, using the telescope's infrared array camera. The survey is one of the six Spitzer Legacy Science projects, designed to reveal how stars are formed in different types of galaxies, and to provide an atlas of galaxy images and spectra for future archival investigations. The Sombrero is one of 75 galaxies being observed by the survey team. In this image, blue-cyan corresponds to the Hubble visible-light view, while the Spitzer 3.6-4.5 micron light is green and 8.0 micron light is red. Starlight in this Spitzer image (measured at 3.6 microns) has been subtracted from the 8-micron image to enhance the visibility of the dust features. In figure 3, NASA's Hubble Space Telescope has trained its sharp eye on one of the universe's most stately and photogenic galaxies, Messier 104. The galaxy's hallmark is a brilliant white, bulbous core encircled by the thick dust lanes comprising the spiral structure of the galaxy. As seen from Earth, the galaxy is tilted nearly edge-on. We view it from just six degrees north of its equatorial plane. This brilliant galaxy was named the Sombrero because in visible light it resembles a broad rimmed and high-topped Mexican hat. M104 is just beyond the limit of the naked eye, but is easily seen through small telescopes. It lies at the southern edge of the rich Virgo cluster of galaxies. It is one of the most massive objects in that group, equivalent to 800 billion suns. The galaxy is 50,000 light-years across and is located 28 million light-years from Earth. Hubble easily resolves M104's rich system of 2,000 globular clusters-believed to be 10 times as many as orbit our Milky Way galaxy. The ages of the clusters are similar to those of the clusters in the Milky Way, ranging from 10-13 billion years. A smaller disk is embedded in the bright core of M104, and is tilted relative to the large disk. X-ray emission hints that there is material falling into the compact core, where a black hole as massive as 1 billion suns resides. The Hubble Heritage Team took these observations in May-June 2003 with the space telescope's advanced camera for surveys. Images were taken in three filters (red, green, and blue) to yield a natural-color image. The team took six pictures of the galaxy and then stitched them together to create the final composite image. This magnificent galaxy has a diameter that is nearly one-fifth the diameter of the full Moon. 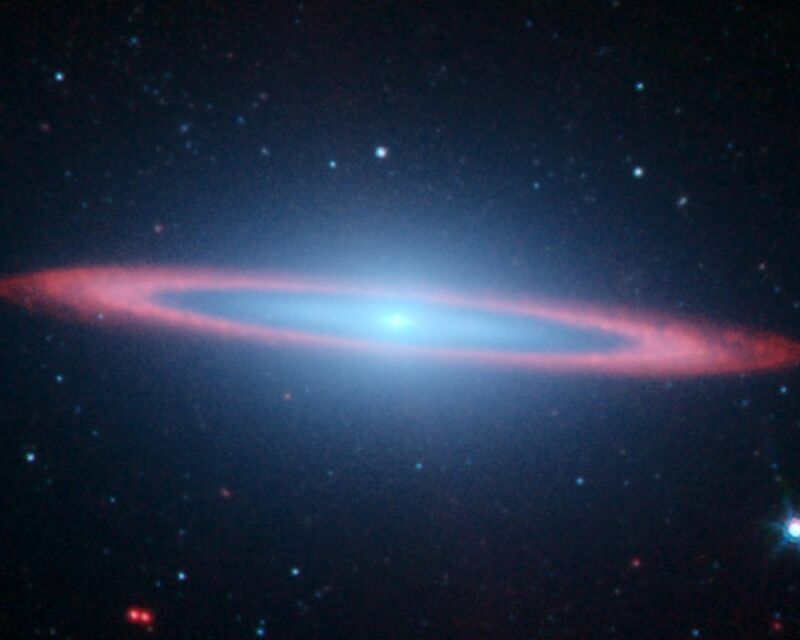 The movie shifts from the well-known visible-light picture of Messier 104 taken by the Hubble Space Telescope to infrared views from NASA's Spitzer Space Telescope. Messier (click on the browse image above for download option).